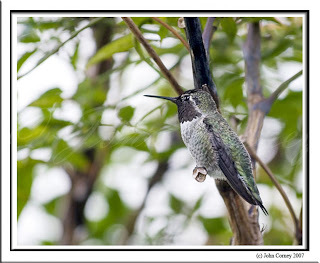 Anna's hummingbirds live in my garden here in Southern California year round. I encourage them with hummingbird feeders in my garden and the action is non-stop year round. Visitors always delight in the show. This year has been the best ever. I guess my garden must be "on the map"; in the spring there were up to 5 birds feeding at the same time. It seems to be that in the spring during breeding season they are less territorial and feed together, but as the year progresses into summer, a dominant bird will take ownership of a feeder and stand guard over it from sunup to sundown clicking away all day long. It's a battle royal, and at times the birds actually manage to get a hold of each other and I have actually seen them wrestling on the deck! I kid you not. Mostly it's a matter of dive-bombing interlopers, and some of them will not give up easily. One night evening last week I just couldn't believe the fights going on out there with kamikaze pilot hummers bombing each other with a great cacophony of angry sounds to go with it. There are times when a bird will fly up vertically to what seems like a hundred feet or more and then will dive at immense speed making an incredible high-pitched whizzing sound with his wings. This is a photo of one of the bosses in the garden right now. That's him standing sentry over "his" feeder. From the side their necks and heads look dark brown to black, but when they face you the light catches their features and turns them an iridescent rose color. The next post will show that. And I'll also share with you my recipe for the nectar for a hummingbird feeder.